According to the norms of the Civil Code, the grounds for the origin (acquisition) of property rights are legal rights, or legal relationships. Ownership can be acquired in various ways, traditionally it divided into two groups: primary, those that do not depend on the rights of the previous owner on the property, and derivatives, under which ownership of the property passes to the owner from its predecessor in succession. 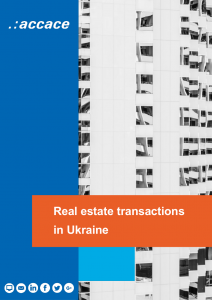 Download our eBook “Real estate transactions in Ukraine” and find more about real estate transfer process, limitations over the acquisition of real estate and real estate transfer taxation. In case of privatization of state property and property in communal ownership (Art. 345 of the Civil Code). Derivative methods of acquiring property rights are usually various contracts: purchase and sale, barter, gift, rent, rent with redemption, as well as inheritance of property or succession in respect of property of legal entities or public entities. The common sign of the derivative method of acquiring the right of ownership is the succession – the transfer of ownership from one person to another. Thus, the basis for acquiring the right of ownership of some individuals is at the same time the basis for the termination of the ownership of others and vice versa. So, the important thing in such cases is the definition of the moment when the right of ownership passes to the acquirer of property. From this moment the burden of ownership also shifts (Art. 322, part 5 of Art. 1268 of the Civil Code) and the risk of accidental destruction or damage to property (Art.323 of the Civil Code). On real estate objects, the rights to which are subject to state registration, the property right of the acquirer under the contract in accordance with Part 4 of Art. 334 of the Civil Code arises from the date of state registration (Art. 182 of the Civil Code), and not at the time of actual transfer of property or at any other time determined by agreement of the parties (for example, the transfer of keys from the house does not indicate the acquisition of ownership of the house in the absence of a contract and state Registration). To obtain the right of ownership of the property by the acquirer and, on the other hand, the termination of the ownership of this object in the property alienator, the following elements are necessary: ​​the conclusion of a contract (notarization and mandatory form) state registration. The procedure for concluding a contract, if all documents are ready can be carried out for a period of one day. In the event that the property is acquired by way of inheritance, the notary through will issue documents confirming the ownership after six months. According to the current legislation of Ukraine, the parties are free to determine the value of the contract. However, the current tax code of Ukraine indicates that the value of the contract of alienation of real estate can not be less than the estimated value of the object that is alienated. Any agreements on the transfer of real estate ownership are concluded exclusively in writing and are subject to notarization and registration. In accordance with Art. 334 of the Civil Code of Ukraine, the rights to immovable property, which are subject to state registration, arise from the moment of such registration in accordance with the law. To the person who acquired the right to own a house (except of a multi-apartment building), a building or a structure passes the ownership right to use to the land plot on which they are placed, without changing its intended purpose in the amount and under the conditions established for the previous landowner (Land user). The size and cadastral number of a land plot, the right to which is transferred in connection with the transfer of ownership of a residential building, building or structure, are essential conditions of the contract, which provides for the acquisition of ownership of these objects (except for multi-apartment houses). The current legislation of Ukraine does not set limits on the number of real estate objects that can simultaneously be owned by one citizen or legal entity. The only exception is the obligation to pay taxes on real estate. Individuals and legal entities can acquire any real estate objects for which there are no records of encumbrances in the Register of rights and encumbrances on immovable property. In addition, individuals and legal entities foreigners cannot acquire land in ownership for agricultural needs. In addition, Ukraine has a moratorium on the alienation of agricultural land. The taxation of transactions for the sale of real estate is regulated by Article 172 of the Tax Code, according to paragraph 172.10 sale by citizens of the inherited (received as a gift) real estate object is subject to taxation. The income received by the payer of the sales tax not more often than once during the reporting tax year of an apartment house, apartment or part thereof, a room, a garden (cottage) house, and a land plot that does not exceed the free transfer rate specified in Art. 121 of the Land Code, depending on its purpose, and subject to the stay of such property in the property of the taxpayer for more than three years, is not taxed. However, the condition of the stay of such property owned by the taxpayer more than three years does not apply to property received by such a citizen (the seller) is inherited. If the payer realizes the sale of immovable property, which he received as a gift, and is in possession of less than 3 years, he will need to pay tax on the income received from such sale on general grounds. The income received by the payer of the tax on the sale of more than one of the real estate objects during the reporting tax year is subject to taxation at the rate of 5% (item 167.2 of Article 167 of the Code). The same rate applies to income received from alienation of property that was in ownership less than three years, including the gifted real estate. In the case when the income received by foreign citizens (non-residents) in the territory of Ukraine, the taxation is carried out in the manner established for the citizens of Ukraine, but the rate of income tax for individuals is set at 15%. You also need to pay a military tax of 1.5%. Before the certification of the contract, the notary will check the payment of the tax to the state budget. For certification by a notary of contracts of purchase and sale of real estate, it is necessary to pay 1% of the contract amount, but not less than 1 non-taxable minimum of incomes of citizens (Article 3 of the Decree of the Cabinet of Ministers “On State Duty”). Also, you need to pay a fee for finding information by a notary in the state register 195 UAH., The fee for registering ownership in the public registry is 160 UAH., For issuing an extract from the state register of rights to real estate 40 UAH. The base for the taxation of residential and non-residential real estate objects, including their shares held by legal entities, is calculated by the following persons independently on the basis of the total area of ​​each individual object of taxation on the basis of documents confirming the ownership of such an object. For various types of residential real estate objects, including their shares (in case of simultaneous presence in the property of the taxpayer of apartments / apartments and houses / houses, including their parts) – by 180 square meters. Meters. Such reduction is provided once for each basic tax (reporting) period (year). The tax rates for residential and / or non-residential real estate objects owned by individuals and legal entities are established by decision of the village, township, city council or council of joint territorial communities established in accordance with the law and the long-term plan for the formation of community territories depending on location Zoning) and types of such real estate objects in the amount not exceeding 1,5 % of the minimum wage amount established by law on January 1 of the reporting (tax) ode, for 1 square meter of second base. At the request of the owners of non-seized property, such immovable property may be contributed as a share in the authorized capital of the company. Let’s talk about how we can work together in Ukraine! Extra hours – to encourage or prohibit? Financial or efficiency (productivity) audit?